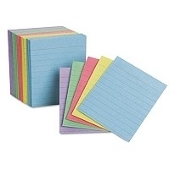 Our Products >> Clip 'n Go Mini Flashcards assorted colors 3" X 2.5"
Clip 'n Go Mini Flashcards assorted colors 3" X 2.5"
Why clip’n go flashcards? Because today’s students are on-the-go, every subject in middle and high school requires memory work, and it pays to get a solid educational foundation. 1 Soft-Touch TagTM "Believe You Can.TM"
One Student’s StoryTM: In 2009, The Program for International Students Assessment ranked the performance of U.S. 15-year-old students in Reading literacy, Mathematics literacy, and Science literacy in an International Context ~ U.S. students ranked 17th in the world in Science and 25th in math. Students may develop holes in their education by the time they reach the upper grades--holes that make it difficult to build a well-rounded solid foundation. So we asked a successful engineering graduate student what they did early-on in middle & high school to get the solid foundation that helped them follow their dreams. The student said, “it wasn’t rocket science” and went on to explain that as the homework became more difficult and other commitments became more time consuming, they were too tired late at night to try and memorize everything required for every subject ~ it became overwhelming and impossible. One thing that helped was creating flashcards that clipped onto their backpack to take along everywhere. These were easy to use during spare time riding in the car, before class, waiting for a club meeting to start, waiting for rides after sports, and even at home lounging on the couch. The student summed it up by telling us that nailing the memory work not only made a world of difference, it left more time to hang out with friends. See our "Resources" page for links. Durable NotesTM is a division of Durable Greenhouse & Nursery Equipment LLC. *This item ships FREE via USPS (United States Postal Service). Shipping within the USA only at this time.